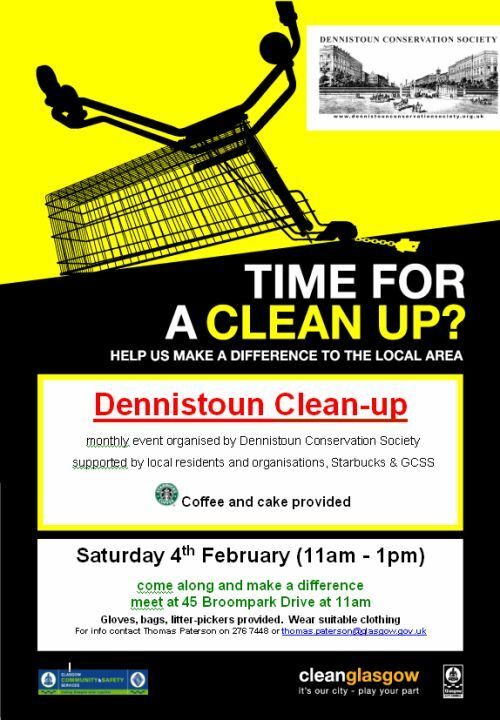 Saturday 4th February, 11am – 1pm. Meet at Broompark Drive gardens, Dennistoun (Street View). Gloves, bags, litter–pickers provided. Please wear suitable clothing. Coffee and cake provided for participants! For information contact Thomas Paterson on 0141 276 7448 or at thomas.paterson@glasgow.gov.uk. For a PDF of the Dennistoun Clean Glasgow neighbourhood charter click here.